If you love eating outdoors and are a sucker for spontaneity, have we got a DIY for you! 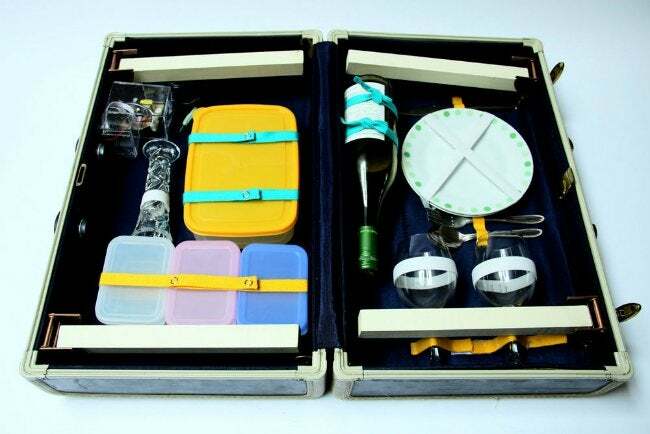 With your own custom picnic case, you can grab and go whenever the spirit moves you. We promise—you'll never go back to baskets and blankets again. A blanket works just fine for picnics—you know, in the way that candles worked just fine before electricity. But if you want to dine outdoors in style and comfort, Instructables author Carleyy can show you how. 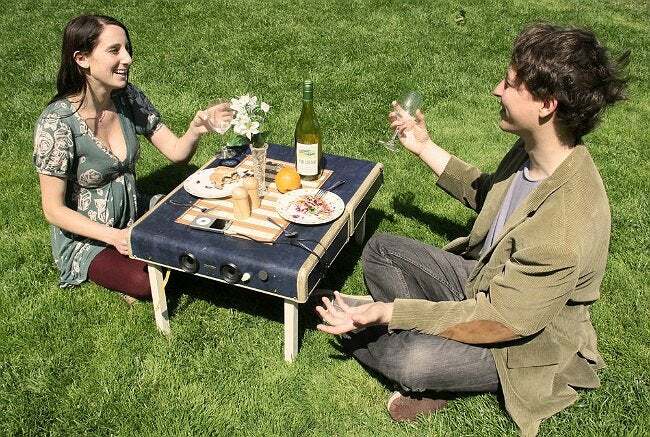 In her alfresco dining hack, what looks like any ordinary hard-shell suitcase actually opens into the tiniest, most fully featured picnic table your neighborhood park has ever seen. Oh, and did we mention this talented table serenades you whilst you snack on wine and cheese? To create your own party-in-a-suitcase, start by making the retractable legs, cutting them to size from a 1″ x 1″ board. Keep in mind that in order for the legs to fold in, they can be only as long as your suitcase is tall. Spray-paint or stain them to coordinate with your suitcase, then screw them to locking braces that you’ve secured within the case interior. It’s equally easy to prepare the speakers. Start by slowly chipping away at the bulky plastic enclosure around a pair of inexpensive USB speakers. Continue until you’ve exposed the wiring. From there, measure and cut two round holes into the top of the suitcase (near where it latches). Fit the speakers through the holes, gluing them into place with epoxy. Hidden inside the case, the speaker wiring can be covered up with either sewn-in fabric or a small, fastened-on plastic box. Finally, add straps, ribbon, and elastic to the suitcase lining to hold your picnic essentials (read: wine bottle and glasses). Three cheers for this brilliant DIY!